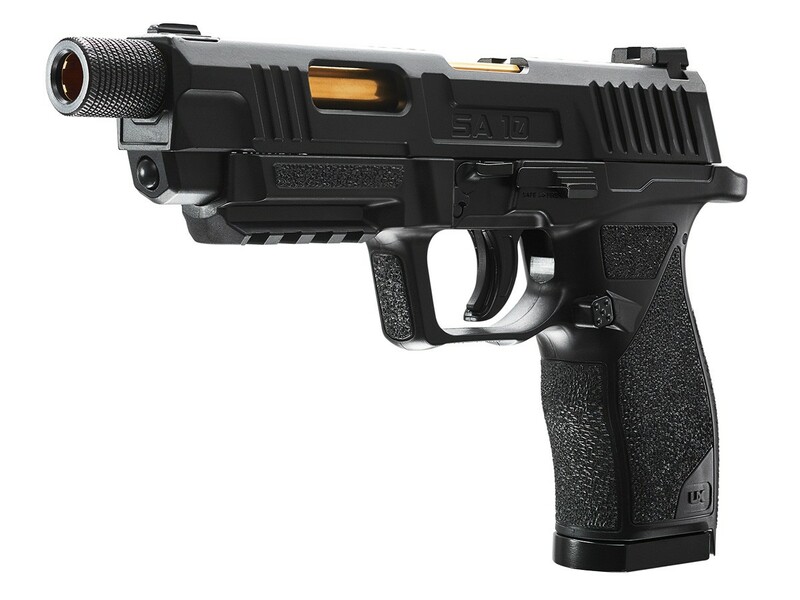 New from Umarex, the SA10 is a BB/Pellet air pistol with one-of-a-kind features. 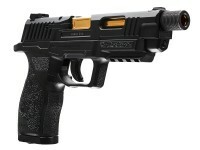 This rugged pistol includes a full-metal slide with polymer grips and a polished gold colored barrel you can see through the cut-out slide. What makes the SA10 really unique is its all new 3 magazine system. Choose Pellets or BBs (or a mix of each) and load the three 8rd magazines. 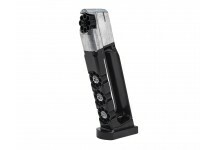 Once you get through your mag., simply pop out the clip, switch in a new 8rd mag and keep shooting! As a result of this new system, not only are the magazines easier to load, but you get an impressive 24 shots total if you switch out all 3 mags. 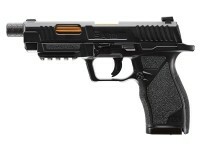 Things I liked: Pistol has some heft and feels like the real thing in your hand. Seems to be well built and robust. Looks good and is free of sharp edges. The trigger is well above average for a gun in this price range and makes accurate shooting easy. CO2 and 8 shot mags are easily loaded. The blowback design is pretty cool and quite strong for the first 2-3 shots on a new CO2 cartridge and then calms down. I fired 8 magazines or a total of 64 shots before the gas began to run out. I fired some offhand groups at 25' using RWS Diabolo Basic 7.0gr pellets and the gun proves to be accurate. It was 17 degrees here today so I did not get any chrony numbers. Overall, a fun gun to shoot and hits what you aiming at. I would recommend this gun to friends. Things I would have changed: I would change the gold parts to black, I'm not big on bling. I would also put a dot on the front sight as the rear sight has and thread the barrel with 1/2x20unf threads. 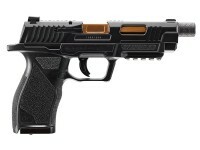 What others should know: This is a nice gun that does what it's supposed to do. I was impressed by the lack of sharp edges, rare for a gun at this price point. It looks good, feels good, and shoots good. I am happy with mine. Things I liked: Finish, but that was about it. Things I would have changed: When I received I noticed what I think is excess play in the slide when you picked up you could hear it rattle against other internals. Then when inserting mag would stop at about 1/4 inch from seating, would have to be forced more than usual to seat, and ejecting mag would stick. Field stripping the SA10 was impossible, as even when release lever was operated the slide still could not be removed without force. What others should know: Disappointed after reading reviews I was expecting a higher quality product. I have several blow-backs and none of the slides are this sloppy. Make sure to check the tolerances when you receive. It's a picatinny rail, they are around 22mm wide. That really can't be answered as the same gun is not available in a non-blowback version. What is the thread size on the muzzle? Can someone at P/A measure this, please?